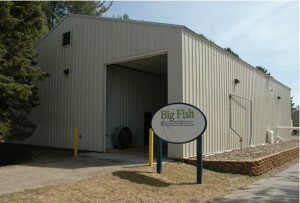 The Big Fish Charlevoix, Michigan facility opened in 2005 and was designated the first permanent septage and high strength waste material receiving and processing facility by the State of Michigan. This unique processing facility is extremely user-friendly. Septage haulers can enter anytime day or night by scanning their I.D. Card. This computerized system identifies the hauler, the volume of material that is transferred, and any other desired information. Haulers can unload their contents and be on their way in less than thirty minutes. Unlike a scaled-down version built for beta-testing, the facility is instead a full-size treatment plant with a 20,000 gallon (daily) processing capability designed to provide wastewater for the City of Charlevoix treatment plant and process waste from the surrounding area. The footprint is very small compared to a typical wastewater treatment plant. The entire system fits in a 64’ x 72’ building including the screwpress and laboratory. All of the processing tanks are buried underground and an air-handling system keeps any odor to an absolute minimum year-round. The Big Fish System is the right process for right now. Sustainable, safe, and natural, it establishes a new and innovative way of addressing what is becoming a serious waste disposal problem. We encourage all interested parties, including professors and students of the environmental sciences, to contact us to schedule a tour of the Charlevoix facility.